Argiope syrmatica egg sac Photo E Collins This spider has four eggs sacs in a tangled web.Normally found in grasses and small shrubs. this one chose a window ledge to create her web and place her egg sacs. 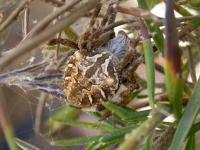 Photo E Collins This spider has four eggs sacs in a tangled web.Normally found in grasses and small shrubs. 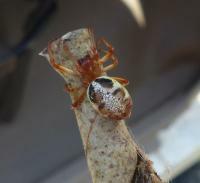 this one chose a window ledge to create her web and place her egg sacs. 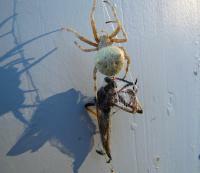 Argiope syrmatica with prey Photo E Collins The prey is a grasshopper. 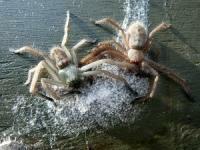 The crinkled web on the left side of the photo is diagnostic of this family of spiders. It has no common name. Photo E Collins The prey is a grasshopper. 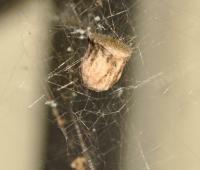 The crinkled web on the left side of the photo is diagnostic of this family of spiders. It has no common name. 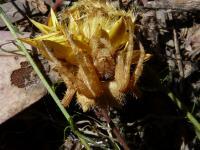 Crab spider on everlasting Thomisidiae family Photo E Collins A master of camouflage. Enlarge to see the eyes and appreciate the disguise! Photo E Collins A master of camouflage. Enlarge to see the eyes and appreciate the disguise! Eriophera pustulosa Photo E Collins A well camouflaged spider on ironbark. Photo E Collins A well camouflaged spider on ironbark. Eriophora heroine Wheel-weaver Photo E Collins This nicely patterned spider leaves its web during the daytime and emerges in the evening. Photo E Collins This nicely patterned spider leaves its web during the daytime and emerges in the evening. Flower Spider Diaea sp Photo E Collins Seen to prey on bees and flies.Flower spiders come in many colours. 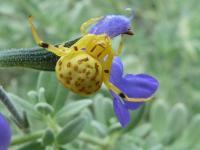 Photo E Collins Seen to prey on bees and flies.Flower spiders come in many colours. 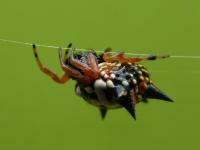 Flower Spider with fly Daiea sp Photo E Collins The prey is bigger than the spider! Photo E Collins The prey is bigger than the spider! 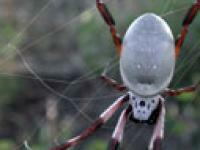 Golden Orb-weaving Spider Nephila edulis Photo E Collins The massive golden webs of this spider festoon the bush in autumn. Photo E Collins The massive golden webs of this spider festoon the bush in autumn. 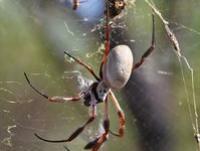 Golden Orb-weaving Spider Nephila edulis Photo E Collins The huge golden web of this spider appears in late summer and autumn. Photo E Collins The huge golden web of this spider appears in late summer and autumn. 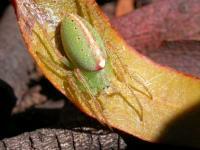 Green flower spider Diaea sp Photo E Collins Nicely camouflaged on a mistletoe leaf. Photo E Collins Nicely camouflaged on a mistletoe leaf. 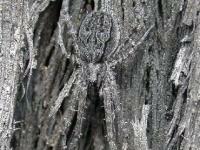 Grey spider on burnt ironbark Photo E Collins Another master of camouflage. Photo E Collins Another master of camouflage. Huntsman with egg sac Photo E Collins Nestled in the shelter of a park pamphlet box this very maternal Huntsman has chosen a good nursery. 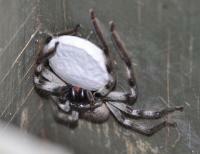 Photo E Collins Nestled in the shelter of a park pamphlet box this very maternal Huntsman has chosen a good nursery. Jewel Spider Austracantha minax Photo J Birckhead Also known as the Six-spined Spider, Jewel or Christmas Spider.This is a female. 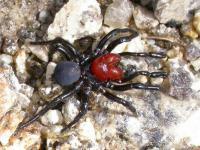 Photo J Birckhead Also known as the Six-spined Spider, Jewel or Christmas Spider.This is a female. Leaf-curling Spider Phonognatha graeffei Photo E Collins A clever way to build a home and protect its egg sac. Photo E Collins A clever way to build a home and protect its egg sac.